3 PRODUCT Ensure accurate, detailed and consistent product information across the enterprise and multiple channels. CUSTOMER Manage and maintain accurate, complete, comprehensive and timely customer data across the enterprise and to all channels. SUPPLIER Streamline supplier data consistency and vendor related data to quickly onboard, evaluate and manage suppliers. 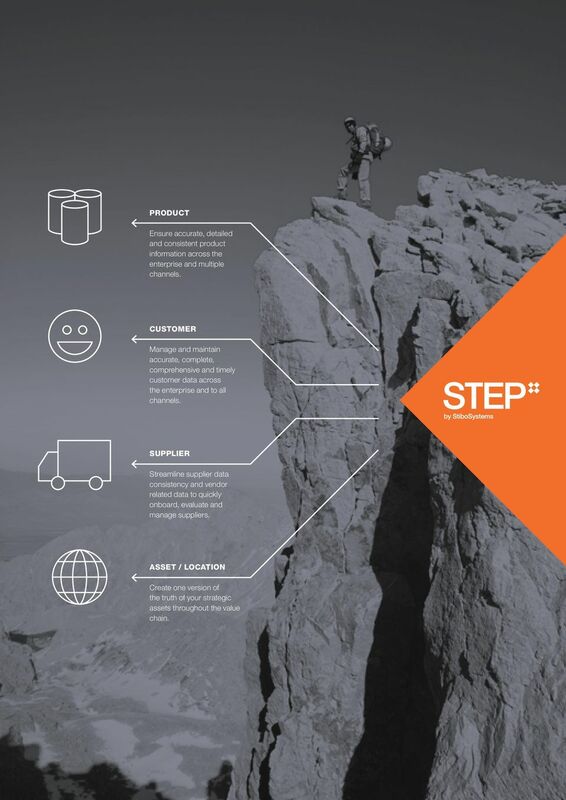 ASSET / LOCATION Create one version of the truth of your strategic assets throughout the value chain. 7 WHEN SUCCESS MATTERS What makes Stibo Systems different? 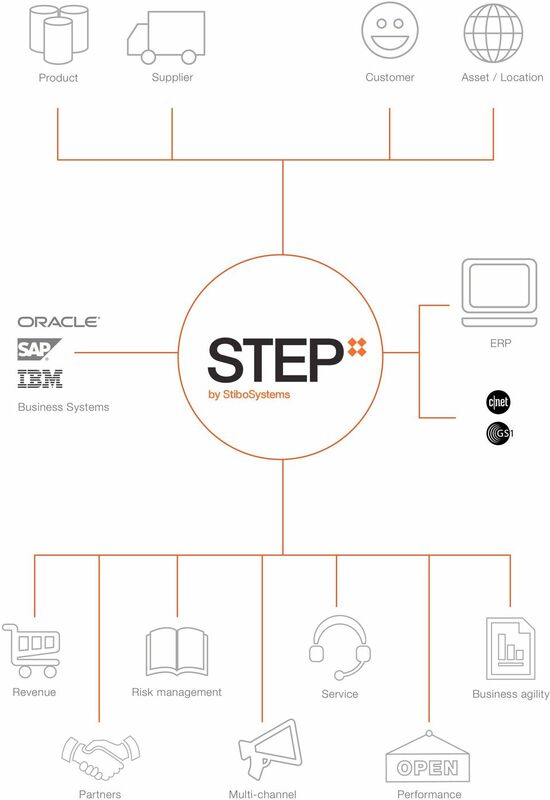 UNPARALLELED TRACK RECORD CULTURE, HISTORY AND LOCATION No other vendor can match Stibo Systems proven track record in the product MDM domain. This success stems from our rich product information management (PIM) and multi-channel publishing heritage. It s also a result of managing product data for clients for more than 30 years a commitment that requires a deep, fundamental understanding of the intricacies of product master data. 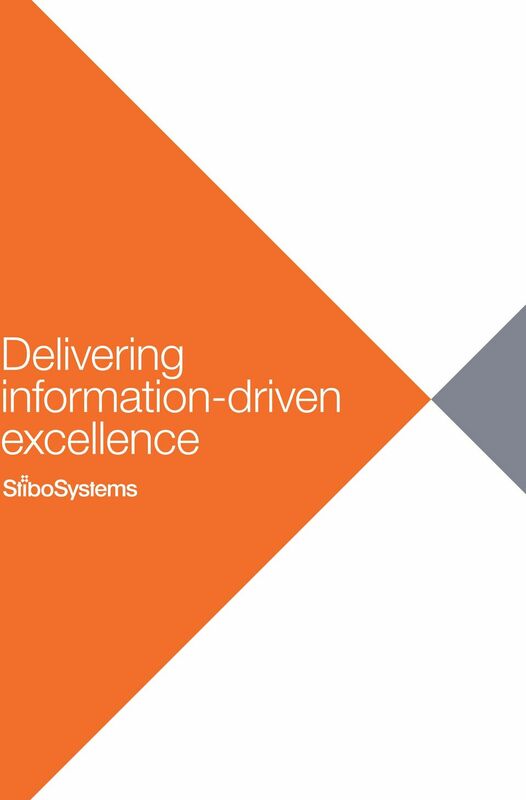 Stibo Systems also has extensive vertical industry expertise and industry-specific capabilities not found in other organisations. Its referenceable client base of global market-leading companies includes Officeworks, GE, Siemens, SONY, Toys R Us, Best Buy, Fujitsu, Philips and Thomas Cook. 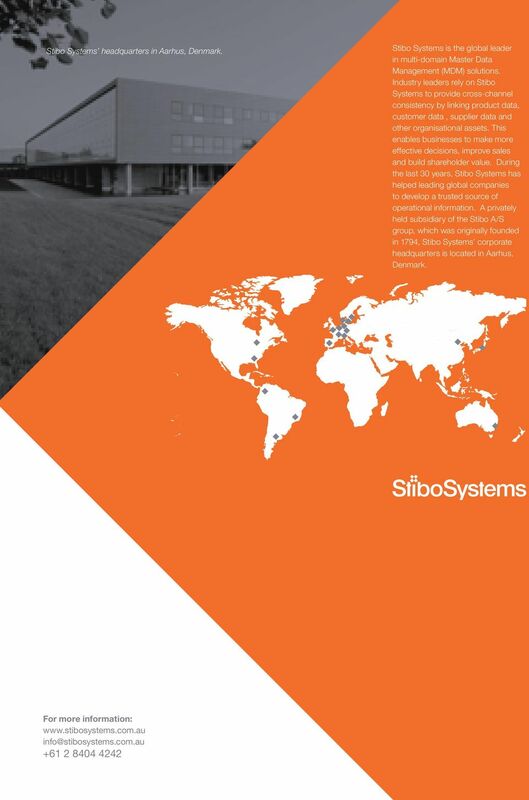 Founded in 1794, the Stibo Group has a long history of service, innovation and adaptability. Through the years, we have transitioned from a traditional printing house to a global leader in the development and delivery of dynamic enterprise software solutions. 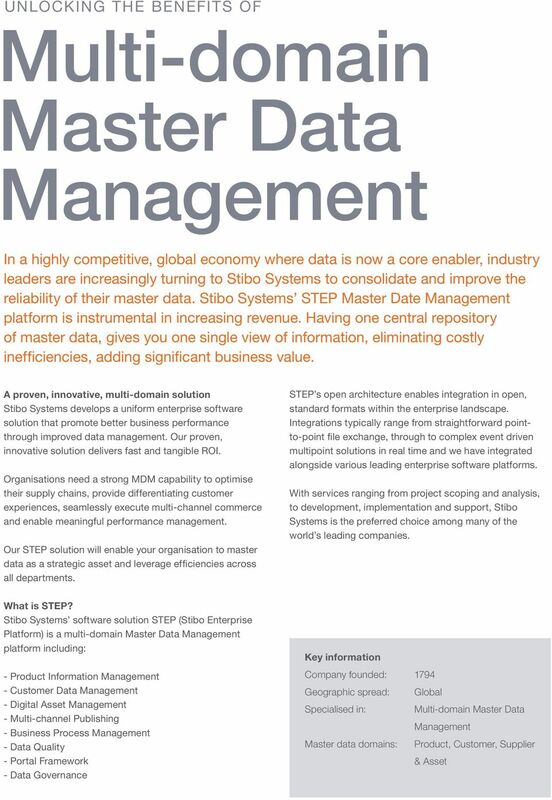 Stibo is a mature, financially stable organisation, and Stibo Systems is by far the most experienced player in Master Data Management. 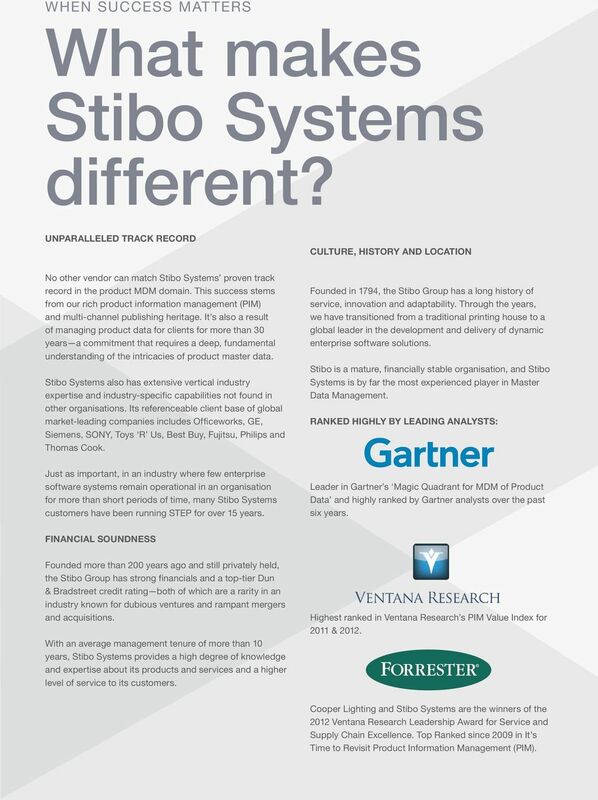 RANKED HIGHLY BY LEADING ANALYSTS: Just as important, in an industry where few enterprise software systems remain operational in an organisation for more than short periods of time, many Stibo Systems customers have been running STEP for over 15 years. 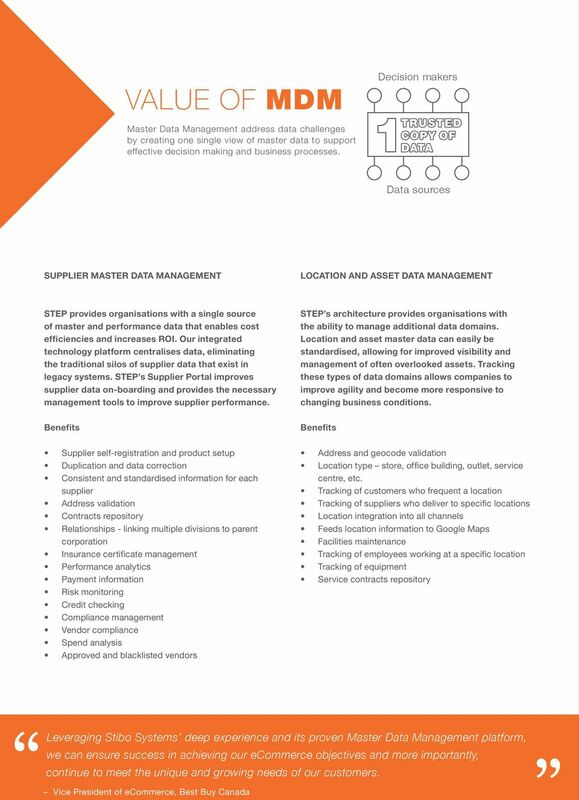 Leader in Gartner s Magic Quadrant for MDM of Product Data and highly ranked by Gartner analysts over the past six years. FINANCIAL SOUNDNESS Founded more than 200 years ago and still privately held, the Stibo Group has strong financials and a top-tier Dun & Bradstreet credit rating both of which are a rarity in an industry known for dubious ventures and rampant mergers and acquisitions. 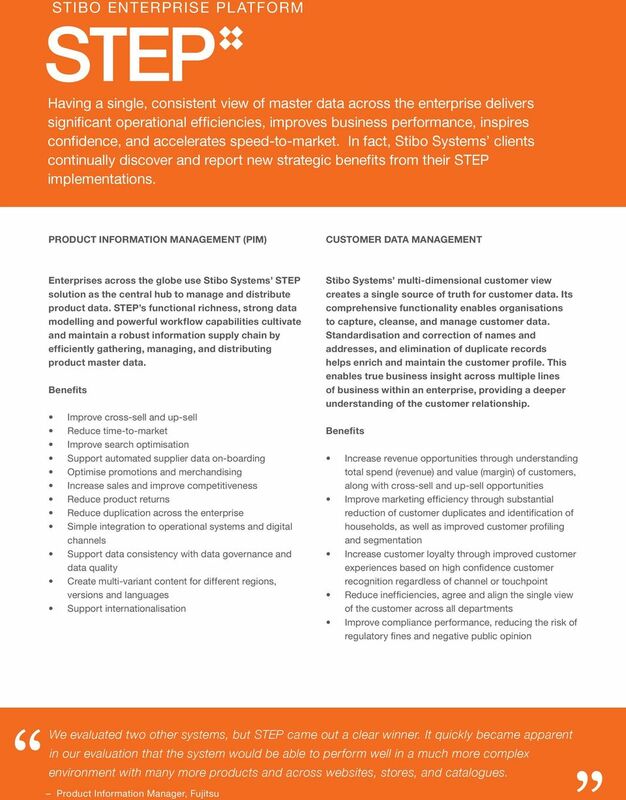 With an average management tenure of more than 10 years, Stibo Systems provides a high degree of knowledge and expertise about its products and services and a higher level of service to its customers. Highest ranked in Ventana Research s PIM Value Index for 2011 & Cooper Lighting and Stibo Systems are the winners of the 2012 Ventana Research Leadership Award for Service and Supply Chain Excellence. Top Ranked since 2009 in It s Time to Revisit Product Information Management (PIM). Why is Master Data Management getting both Business and IT Attention in Today s Challenging Economic Environment? Digital Strategy. How to create a successful business strategy for the digital world. WHITE PAPER Subscription Business 2.0 Is your business ready for it? GET IN TOUCH (844) 4OB-SOFT sales@onebillsoftware.com 2015 OneBill www.onebillsoftware.com 1 What is a Subscription 2.0 Billing Platform?